Dumond’s unique rustic salvaged wood furniture is handmade from Walnut, Cherry, Bubinga, Maple, Oak and other unusual woods. These unique, unusual, and artistic salvaged wood furniture pieces are made to order! Call today for your free quote on any of our salvaged wood furniture pieces. Custom Salvaged Wood Desk made from ash and cherry. One of a kind cherry slab salvaged wood computer desk with ash lower panels and ebony drawer pulls. Dovetailed drawers out of Siberian elm with sycamore drawer bottoms. Notice the crack in the cherry slab top spanned by 3 ebony butterflies to add style and strength to prevent further checking. Custom salvaged wood desk made from a Walnut crotch slab. This open design below the desk top allows the user to move around freely without bumping into a bank of drawers. Custom rustic Cherry salvaged wood executive desk. This custom executive desk was designed and built for a doctor friend of mine for his 40th birthday. His wife surprised him with this one of a kind gift. Can build a similar salvaged wood custom desk. Call today for a free quote! Custom Executive Salvaged Wood Desk Handbuilt from beautiful ash and cherry wood slabs. One of a kind cherry salvaged wood computer desk with ash lower panels and ebony drawer pulls. Dovetailed drawers out of Siberian elm with sycamore drawer bottoms. Notice the crack in the cherry slab top spanned by 3 ebony butterflies to add style and strength to prevent further checking. Unique rustic walnut salvaged wood slab headboard and foot board. The walnut in this bed came from a farmhouse in Humbolt, Nebraska. The tree was sawn in the fall of 1968 and sat in the barn for over 25 years before the wood came into my hands. For 5 years I thought of a way I could use these beautiful pieces of crotch walnut without losing the beauty of the sapwood. Finally this design came to me after much thought. Mortise and Tenon joinery with hickory pins capped with ebony and ebony caps on each post. (see close-up). Custom Salvaged Wood Hutch or China Cabinet hand built from rustic oak slab. Rustic custom hutch or china cabinet using natural bug holed salvaged wood, quarter sawn, red oak. Antique glass in upper cabinet doors. Stickley hardware and adjustable glass upper shelving and oak lower shelving. 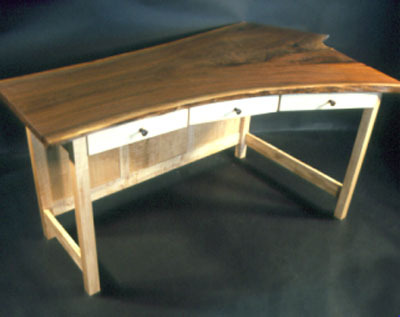 Interior – adjustable natural edged shelves and two dovetailed drawers with burl walnut drawer fronts with hand turned knobs. A great place to store your silk scarves and perfumes. Size 60″ H x 26″ W x 11″ D.